APPLY TO BE A VOLUNTEER LEADER! Double your impact as a HandsOn Volunteer Leader! Address the Valley's most pressing issues while inspiring other volunteers. Choose a project you're passionate about that occurs at a time and place that's convenient for you, and create a positive service experience for local agencies and volunteers alike. 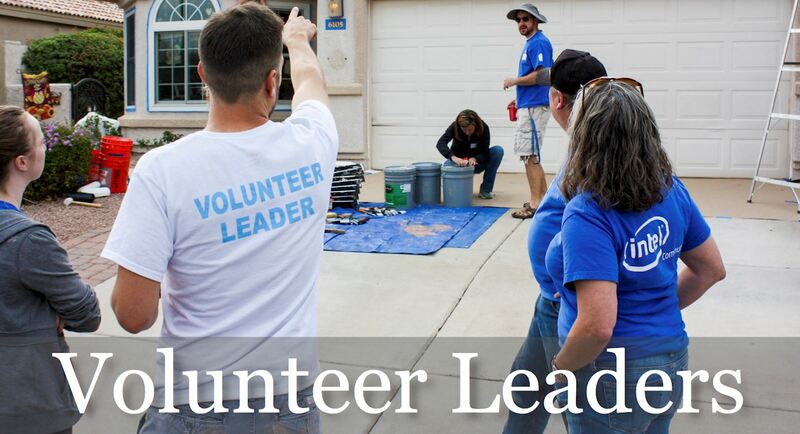 Volunteer Leaders can commit to oversee volunteers in service at our regularly-occurring Calendar Projects, or at our one-time service events and corporate projects. 1. Fill out our Volunteer Leader Application. 2. Attend a brief training with HandsOn staff; we'll make sure you have everything you need to lead a successful volunteer project! 3. We'll match you with a project that's perfect for your interest and schedule, and provide ongoing support so you can help volunteers make the biggest possible impact! Questions? Contact Chris Helmuth at 623.223.9075 or chris@handsonphoenix.org.